The start of the Atlantic Basin hurricane season is June 1st and goes through November 30th each year. Typically, we might see a few small homegrown or near coastal systems develop along tail end of cold fronts…or warm, moist easterly trade winds helping spawn a few tropical waves into the western Caribbean/Gulf of Mexico. 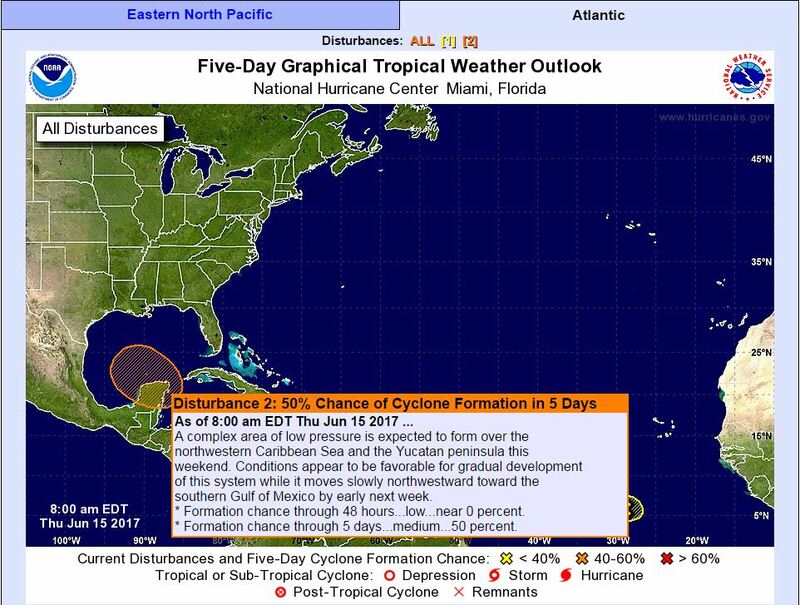 For the 3rd year in a row in the Atlantic, we have had a tropical cyclone develop before the official start of the hurricane season. Tropical Storm Arlene (April 19) was a fish storm pretty far out that looped around and was torn apart by an upper Low. More on schedule with its season (May 15-Nov 30) was briefly lived Tropical Storm Beatriz in the Eastern Pacific, which made landfall over southern Mexico and eventually supplied a good bit of moisture into the SE United States that helped drop record rainfalls in Florida (not good for flooding, but was good for their rather serious drought situation). This is a more typical origination point we might see according to NOAA’s historical tracks. What is not typical is to see tropical waves holding strength as they propagate westwards off the African coast along the ITCZ (inter-tropical convergence zone) this time of the year. This zone is an equatorial warm monsoonal trough zone where abundance of moisture is usually available for tropical systems to develop. The ITCZ sits further south and slowly drifts northwards where development becomes more favorable later in the summer and into the fall during what is called the “Cape Verde Season”. 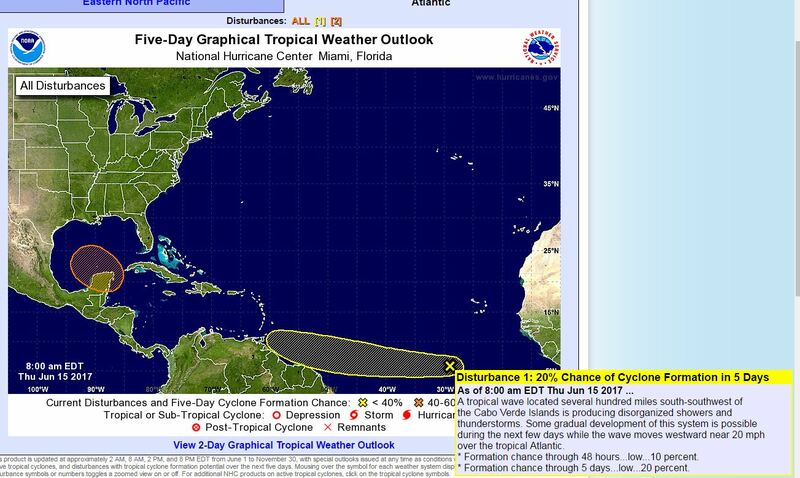 There is an area now being watched that the NHC is giving a 10% chance next 48hrs and 20% next 5 days. This shows the wave coming off and heading west…and behind it is yet another (and rather impressive) tropical wave showing lots of convection as it enters over the Atlantic Ocean. There is dry air ahead and upper shear, so the environment is not that conducive. However, if it holds together further west, it could get pushed into the western Caribbean where those warm easterly trade surges may help supply more moisture into it. Very far off to tell just yet with a higher likelihood of it dissipating. In this area, we watch for lifted and suspended Saharan Dust in the mid levels of the atmosphere to dry systems out, but in this case the wave is further south to escape most of the moderate effects. Important to note that this dust layering helps fizzle out many “would be” systems from developing and possibly becoming problematic for us in the US! The other area being watched is near the Yucatan into southern Gulf of Mexico (Bay of Campeche), which has a medium chance now at 50% next 5 days. The Sea Surface Temps are plenty warm at the top between 82°-86°F according to the latest NASA Sport SST 2km imaging. BUT…we always look at TCHP (tropical cyclone heat potential), which does not look favorable for prime conditions in the southern Gulf of Mexico at the moment, but is increasing a bit as of present. Some of this information gauges the actual “depth” of the warm waters, which when stirred will cool quickly. Models are beginning to split on which way this system goes, with the GFS taking it north and the EURO taking it west. We’ll have to watch for High pressure over the central United States and upper shear being a limiting factor in this area of disturbance. Nothing definite yet, and no immediate threat to land. We’ll be keeping an eye on the tropics. Stay safe!